A laptop bought at a car boot sale contained sensitive details about children in care. Shaun Coffell said files on the computer were marked Sunderland City Council and contained details of care assessments, prospective foster carers and court hearings. The 29-year-old, of Gateshead, described the discovery as "worrying". The council has launched an inquiry and said staff "will be reminded they must not use unencrypted equipment". 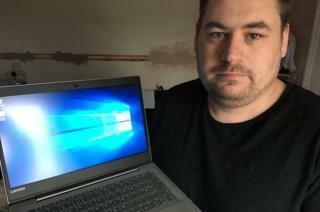 After purchasing the laptop at a sale in Blaydon, Mr Coffell said he turned the laptop on and found files marked "Care" and "Care Assessment". "Sunderland City Council was marked on every page," he said. "It's quite worrying. It could've got into the wrong hands." The authority has since collected the laptop from Mr Coffell, who said he was told it was likely it had belonged to one of the organisation's social workers. It has provided him with a replacement. The council said it and its partner agencies "take the protection of data very seriously". It added: "We have robust procedures to ensure sensitive material is stored securely and is encrypted by default on staff laptops to protect the privacy of customers. "Staff will be reminded they must not use unencrypted equipment and to immediately report the loss of IT equipment."